This item is a sample for potential new clients only. Add this item to your cart and tell us in the “Order Notes” section at checkout which varieties of base mixes or flavor concentrates you want to try. We can send you more than one variety of base mix and flavor. Just let us know which base and flavor you want for each bag in your cart. These are full size bags of Nanci’s dry base mix for new clients to sample and test in their machines. Add this item to your cart and tell us in the “Order Notes” section at checkout which base you want to sample. 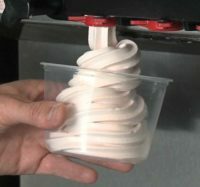 A soft-serve machine is required to try these samples. *This item is only available to new clients and is not available for re-order. After trying these samples, the minimum order quantity is 1 case of 5 bags of all the same type of base mix.